“Resolved, that an increase of Prosperity causes a corresponding increase of Morality”. 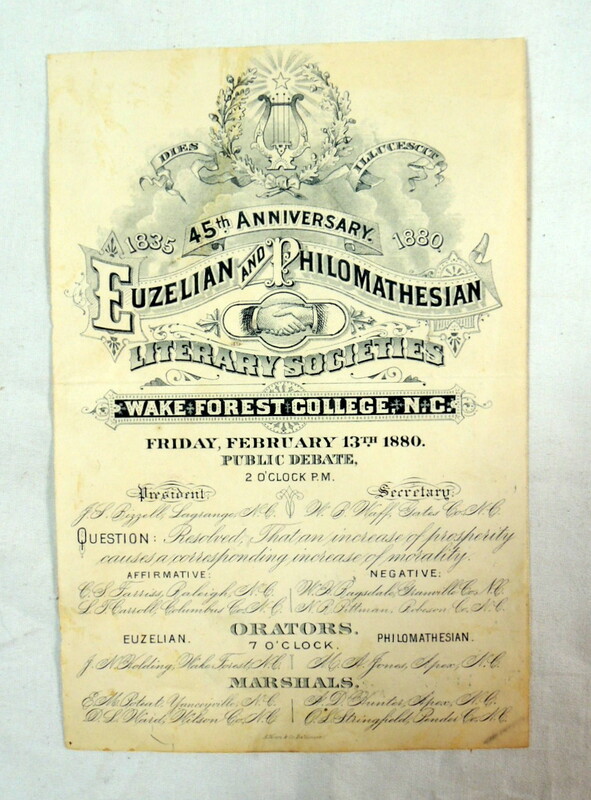 Antique Original One-Sheet Paper Program Includes Names of President, Secretary, Orators, Marshals and Debate Participants. A few photos of a real petrified Hadrosaurus dinosaur egg in the Azio Media retail store in Shallotte, North Carolina. Hadrosaurus lived in what is now New Jersey, in the late Cretaceous period. It could use its forelegs to support itself while feeding—like all hadrosaurids, Hadrosaurus was herbivorous. WE BUY AND SELL: OLD BOOKS, VINYL RECORDS, VINTAGE POSTERS, MOVIE MEMORABILIA, MAGAZINES, WATCHES, COINS, ART, COLLECTIBLES, ANTIQUE MAPS. SELL YOUR ANTIQUES, TREASURES & COLLECTIBLES HERE.